A MULTI-MILLION pound, state-of-the-art, business park remains half empty two years after it was opened. Costing £7.6m, the pioneering Enviro 21 park on Queensway, St Leonards was launched in the summer of 2010. It was funded by £3m from a bank lender and £4.6m from the Government via the former South East England Development Agency. But just one business moved onto the site leaving two units empty. A flagship conference and banqueting suite sited at the park entrance, boasting stunning views across the rolling Sussex countryside, has also stood idle. A new land regeneration company, Sea Change Sussex, now plans to open the building later this summer. The property developer has also acquired 5.4 hectares of land further along the road called Queensway North which it hopes to develop into a business park with custom-built units. The only business to move to the site was Poppypac Ltd which manufactures cosmetics. 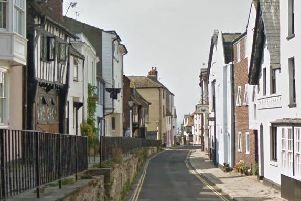 The firm needed to expand from its former premises at the Atlas Estate in Rye and moved over in the winter of 2010. But Poppypac’s founder and joint director, Louise Deering, said: “We thought this place would become a thriving eco-friendly business park but that seems to have died a death. “We were promised a wind turbine to generate power for the site put that never happened. “I think the deep recession is not helping and I can’t see that any new road like the Bexhill Link will change anything. A wind turbine was a proposed element of the original scheme and there are still plans to bring one onto the site. John Shaw, chief executive of Sea Change Sussex, said: “The recession has been a factor for the lack of interest so far. “We found that the economic climate meant there was more demand for smaller and larger units than the mid-size units on site. “Within a matter of months of us launching this site, the US banking crisis started. “We were then into unchartered territory. “But I see it as an opportunity. More than 10 per cent of employment in Hastings is in the manufacturing industry. That is higher than anywhere else in the South East region. Councillor Peter Chowney, lead member for regeneration, said: “I am disappointed the site has been empty for so long.